There are a couple of problems though. 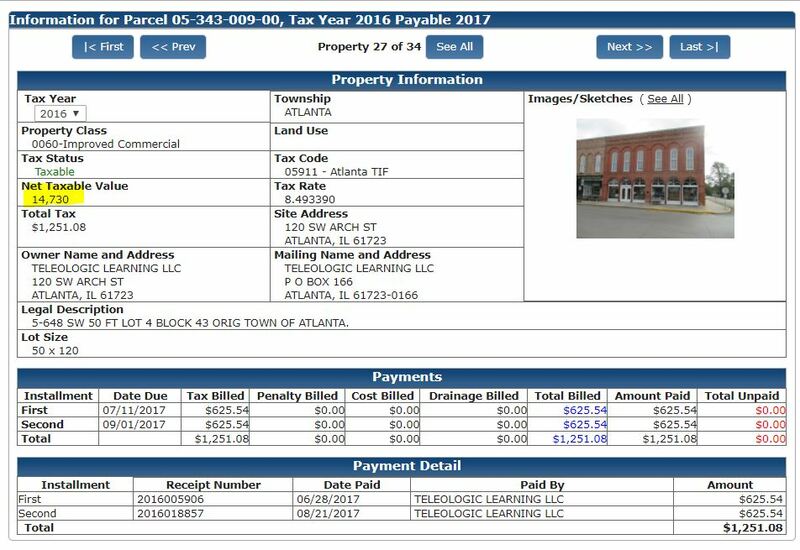 The documents claim the address is 114 Arch Street, the Logan County Assessor’s office has it located at 120 Arch Street in Atlanta. Take the “54” off the PIN number, and the PIN on the documents match the Assessor’s site. That appears to mean the assessed value that Bill Thomas has been paying taxes on exceeds the current appraisal. Keep in mind, only a few short months ago Bill wanted the library to buy it from him for $200,000. Now these documents claim it is worth $155,000 which is supposedly less than the appraised value for property tax purposes. Also, who did the current appraisal is blank. This site says the taxable value is $14,730. Multiply that by 3.33, and the County thinks the total value of the building is $49,051. Yep, that’s less than what Bill wants to write off his taxes for being generous in an attempt to solve his legal problems. 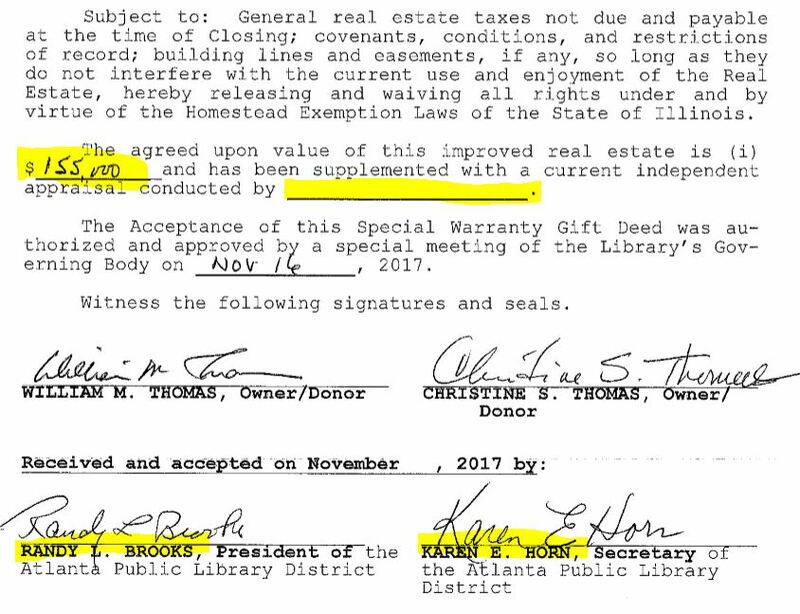 Evidently Library Board President Randy Brooks and Secretary Karen Horn haven’t figured out that everything Bill Thomas says needs checked. The documents do not give Bill Thomas permission to use the office on the second floor. I hear he was there anyway this morning. A FOIA has been filed for the rent agreement allowing him to use the office and the appraisal. Stay tuned. Posted in BloNo, Local, Taxes.Tagged Atlanta Public Library, Bill Thomas, Gift Deed, Karen Horn, Logan County, Randy Brooks, Union Hall. I remember when that corner building was a grocery store back in the 1960’s. I believe it was named Cotner’s at the time. They sure seem to have a mess going on there. The state want’s their grant money returned also. Standby because I think it’s going to get ugly. The plot thickens & there are so many more issues to unfold. Amazing that they continue to do more wrong, when they know the public is watching them, & feel they can get away with it & the whole board is backing them, too! Next Post It’s confirmed: Laws Don’t Matter!